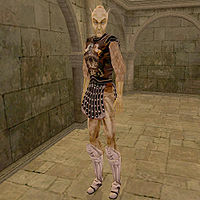 Aldaril is an Altmer battlemage who works at Buckmoth Legion Fort, near Ald'ruhn. He has a selection of spells for sale to any who need them. He is a member of the Imperial Legion, so if you are as well, you must be wearing a uniform or outrank him, or he will refuse to speak to you. Aldaril wears a common shirt with matching pants, and an Imperial steel cuirass with matching boots. He also and carries common shoes, two random potions, a random amulet, and up to 60 gold.